The 0-3 Cleveland Browns, looking for some sense of hope going into week 4, faced off against AFC North rival in the Cincinnati Bengals. With both teams struggling, it was a chance for the Browns to gain some momentum and turn the early season around. Only, they couldn’t. The Bengals jumped on the Clevelanders early with 3 Andy Dalton TD passes to an array of receivers: AJ Green, Tyler Kroft, and Gio Bernard. The Browns offense struggled mightily, with QB DeShone Kizer having another rough outing. A bright spot for the team was in the receiving corps, though, as Kenny Britt, Ricardo Louis, and Duke Johnson Jr. all racked up 45+ yards on the day. After the early offensive explosion by the Bengals in the first half, knotting them with a 21-0 halftime score, they came back and put the game out of reach in the second half. Kicker Randy Bullock connected on a 41 yarder, and Tyler Kroft caught his second TD pass of the day from Dalton to make the 31-0 late in the 3rd quarter. With Kizer’s day being done, Browns backup QB Kevin Hogan stepped in and led a TD drive with 2 minutes left in the 4th to at least put the team on the scoreboard and gain some momentum before taking their 4th consecutive loss. 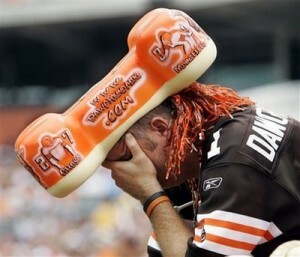 This is another loss that concerns Browns fans everywhere. If we can’t play well against a struggling team, how are we supposed to compete with the great ones? It is the million dollar question that Hue Jackson and company still have yet to figure out as this season progresses with the rebuild. ← Previous Story Should MLB Make Wild Card 3 Games?